St. Peter’s teacher, Karen Bailey, felt it would benefit her students and her school if a rain garden would be constructed in the school courtyard (above). This courtyard has roofs on three sides which directly drain storm water runoff to the central courtyard drain. She spoke to MRWA Program Director about her dream and it began to take shape. In preparation for the project, Karen taught her students about storm water and rain gardens. They learned that native plants are used in the gardens because they have deep roots that absorb great volumes of water and are accustomed to Michigan’s climate. One of Karen’s students, Gabriel Vermeer, studied rain garden construction and computed all the necessary calculations for his 6th grade science fair project. 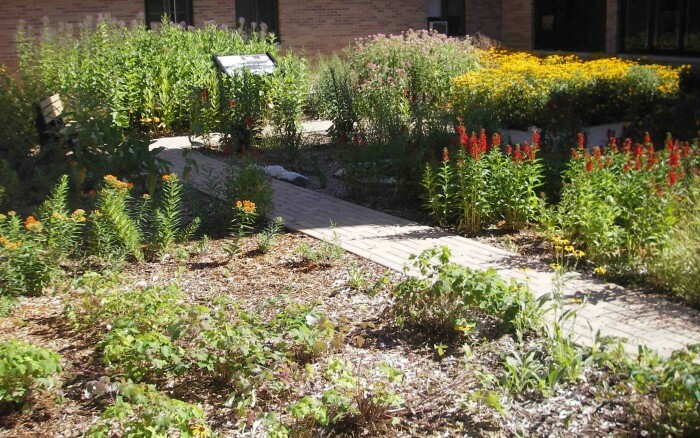 The St. Peter’s rain garden was constructed during the week of September 21 and planted on October 13, 2009. Funding for the project was obtained through grants from the Consumers Energy Foundation, Wege Foundation and Wildflower Association of Michigan and a donation from a St. Peter’s Lutheran Church member.